Lockheed Martin has a long and storied history of supporting the ADF. With 70 years of history to build upon, the company is well positioned to continue its support of key, fifth-generation maritime warfare capabilities as they come online. 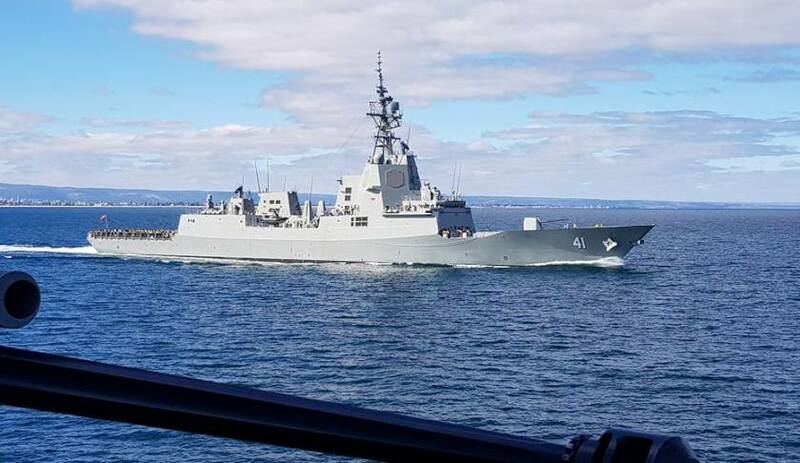 As Australia continues its historic peacetime build-up, Lockheed Martin is answering the call to ensure that the nation's next generation of naval warfare capability of Guided Missile Destroyers, Future Frigates and Future Submarines is capable of providing the uniquely Australian capability Defence needs and keeps Australian service men and women safe when they are deployed. In the latest instalment of On Point, Vince Di Pietro, Lockheed Martin Australia chief executive, and Neale Prescott, director of business development at Lockheed Martin Rotary Mission Systems (RMS), discuss Lockheed Martin Australia's uniquely Australian flavour, capability development and the role the world leader will play in helping to transform the nation's naval warfare capability. Phil Tarrant: Welcome to the podcast today. It's a pleasure for you to join us as we navigate this world of defence and defence industry. A vibrant industry, an industry in a state of flux, and flux being a good word in this regard, a massive amount of growth in capability enhancements underway, which we discuss in the podcast every single week. Today, we're going to deep dive into maritime sector. On the phone, so we're not recording from a studio we're doing it in different states, so I have the team from Lockheed Martin Australia, Vince Di Pietro, chief executive, Lockheed Martin Australia, and also Neale Prescott, who's a director, business development, Lockheed Martin Rotary Mission Systems or RMS. How are you guys feeling it down at Lockheed Martin? Vince Di Pietro: Feeling it very comfortably, thanks so much for the question, Phil. In fact, I'd like to put a finer point on it. When we last spoke it was 250 employees ago, because we've grown that much in 12 months. I'd like to take full credit for it, but, of course, that's not going to be likely or truthful. However, back in 2016, we divested a large part of our workforce here in Australia in a certain business activity, which reduced our footprint down to about just under 500. Since that time, we've acquired and brought on board the Sikorsky Aircraft Corporation, so the main helicopter provider of choice for navies around the world. We've also continued to grow particularly in the maritime capabilities in systems engineering and combat system engineering integration in particular, the most notable, of course, of which is SEA 1000, the combat system for the future submarine. We're in full swing of integrating that design right now, and it's added another 160 or so people to us so far, and we look to be at about 200 by end of this year. Phil Tarrant: I feel quite fortunate in that over the last year or so, I've got a lot closer to the Lockheed business and understand the way you guys operate and the culture of the organisation, and you launched a very exciting initiative. I think maybe it was early this year with your new innovation centre down in Canberra, your new offices. The investment in the long term, Lockheed is key. But the culture of the business I find very Australian as well. Obviously, there is some US executives in there. But it is an Australian business with a lot of Australian people. Can you give us a bit of an idea that identity of being an American organisation but truly an Australian company? Vince Di Pietro: It's very important for us to realise that Lockheed Martin Australia is an Australian proprietary limited company. It does have an Australian chief executive and an Australian board. It is a wholly-owned subsidiary of Lockheed Martin Corporation. That goes without saying. However, if you have a look at what we've contributed to the Australian economy, and KPMG identified the 2016 contribution immediately after the divestment of basically being at $340 million. We've grown significantly since then. Our workforce has in it about 400 engineering and systems integration experts that can actually start putting their talents and ingenuity to the challenges of the future. Very importantly, we also offer about 3,500 Australians a terrific opportunity to be a part of the sovereign capability we want to be a part of growing. Insofar as that the way they work for Lockheed Martin, they are all making and producing things for us to join the global supply chain, because they are the best of breed in what they do, and they've been able to win their work on a competitive basis globally. Phil Tarrant: Neale, can you give us a bit of a brief on what your responsibilities are, and what you're doing there? Neale Prescott: Absolutely. It's a very diverse portfolio. It spans maritime combat systems in particular at the present time. That covers command and control, intelligence surveillance and reconnaissance, and also responsibility for our rotary wing work, so a very diverse portfolio. But what unites them is something that Vince just talked about which is typically the combat systems inside of them. That's the sensor suite, the tracking and decision making aspects of the combat system and then their contributions to the countermeasures and weapons that are employed. Our work here is very much oriented around the development, the integration, and then the testing and fielding. Increasingly, we're getting involved in sustainment. That gives you a bit of a very quick cross-section of my responsibility. Very briefly, Phil, there are three different combat systems there. On the submarine, there's a system called BYG-1. On the Australian Air Warfare Destroyers and now the future frigates, there's the Aegis combat system. The MH-60 Romeo has a specialised combat system. I think what's key there though is all three of them share the same characteristics. They all use acoustic sensors, radar sensors, electro-optic sensors. All of them then combine that information to track potential adversaries and then if necessary respond to adversaries. Phil Tarrant: I imagine the 3,200 jobs associated with this within your supply chain will continue to grow as your footprint across this combat system integration expands as well. Is that something we'd look to see in the future? And we spoke about it very briefly, sovereign Australian capability, industrial capability, a key focus for the government to ensure that we have our own, home-grown talent to be able to deliver not only capability building but also sustainment. A big part of that is technology transfer. Can you tell us about the process for how that happens? Technology coming out of the US into Australia, being able to equip our local talented people to be able to play a key part in the delivery of these capabilities. Just quickly, how does that work? Vince Di Pietro: Put very simply, in as many of the things that our expertise and our engineering capabilities and our integration capabilities can be brought to bear towards, well, then those things will all bring with them additional and significant levels of Australian engagement and jobs to meet that challenge. Because the majority of the people that will be engaged in all of those activities will be Australian. That the corporation back in the States will be the place where those Australians can actually reach back into when required to actually increase and improve their level of engineering and technical expertise to bring the capabilities to bear. It's a really exciting time. I'll hand over to Neale for more details, but from where I sit, for example, when you visit the SEA 1000 laboratory down in Adelaide, you see their org chart, it's up around just over 160 folks at the moment. They're mostly bar a handful, and I mean a handful less than 10 on the chart, are all Australian. The way that the technology transfer works is that we have bought a sovereign capability if you like being such the property of which belongs to the United States Navy, which is what's in the submarine. But those people that come on board become, obviously, trusted, security-cleared, and fully competent and assessed as able to do the task of building a single system in Australia. In that whole activity comes a natural transfer of knowledge, a natural understanding of how the systems work, how they're supposed to connect, and how you can integrate them into the subsequent submarine or ship. But put very simply, it's a long process, but it's one that has to be really understood as being vital to the ability of us to produce the sorts of capabilities that the taxpayers asked us to do, and the government has entrusted us with. Neale Prescott: Phil, just a very quick couple of examples, I think. If I look at Aegis with their test team, we spent several million dollars over the last couple of years to ensure that we've got Australian technicians who actually have been sent to the United States. They've undertaken training with Lockheed Martin. They've undertaken some training with the US Navy, and, now, they've come back, and they've been operating on the ships in Adelaide, and they'll continue to grow that. It's an active campaign that we've had there. On the submarine and also on the Romeo helicopters, we've adopted a process of having a mentor. As Vince said, we keep the number of US personnel low, but what we do actively there is establish a mentorship, develop the skills and the certification of the Australian team, so that in the three- to five-year period, you've now got organic skills, expertise inside the company. That really benefits, because what we're finding is those people also contribute to our product development through the global supply chain and through some of the international programs we're involved with. The full Defence Connect Podcast with Vince Di Pietro and Neale Prescott is available here.